Animals from the Bible is a collection of delightful tales from Christianity’s most sacred book, the Bible. This unique children’s pictorial is a modern-day compilation of Biblical stories from which we learn God’s vision for the world and our role in it. 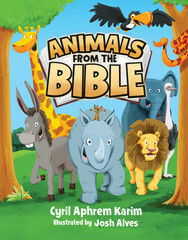 Written with elegant simplicity by His Holiness Patriarch Aphrem II, Animals from the Bible explains the symbolic importance of the many treasured animals that played key roles in some of the most compelling events described in the Bible. Begin the journey by learning the story of God’s creation, when Adam and Eve lived in harmony with each other and with all the animals in Paradise. This is a great beginner’s book that helps spread the word of God. A visually stunning pictorial, Animals from the Bible brings each story to life, helping children understand why we should respect and take care of one another, all animals, and the environment itself. In the end, readers will discover God’s glorious message to us all.